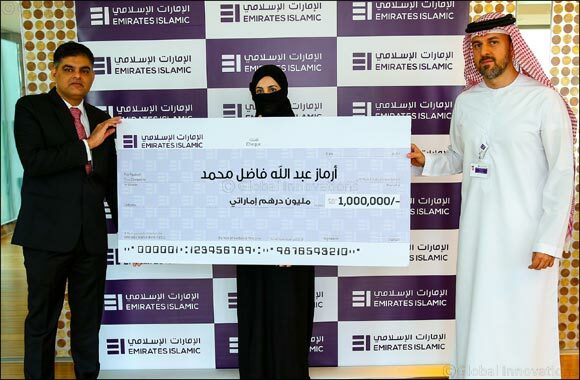 Dubai, 22 January 2019: Emirates Islamic, one of the leading Islamic financial institutions in the UAE, recently handed over the AED 1 million cash prize for its monthly Kunooz Savings Account draw to the lucky winner, Ms. Armaz Abdullah Fadel Mohamed, a citizen of St. Kitts-Nevis-Anguilla. Voted Banker Middle East Product Award’s Best Savings Account in 2017, Emirates Islamic’s Kunooz Savings Account is the bank’s flagship account that offers customers a chance to win grand prizes of AED 1 million or a Tesla car for every AED 5,000 maintained monthly in their account. Additionally, customers have a chance to win one of five cash prizes worth AED 3,000 every day for every AED 1,000 maintained daily in their account.